“A Place in Your Heart.” Words and music by Sam Coslow. Recorded by Elsie Carlisle with orchestral accompaniment on June 14, 1934. Decca F. 5071 mx. TB1320-2. “A Place in Your Heart” is a comparatively conventional love song whose lyrics feature the singer’s professed wish to inhabit a metaphorical dwelling place in her lover’s heart (“Some secret little corner where I’d stay, / Lock the door and throw the key away….”). The tune is pleasant and catchy, but the strongest point of Elsie Carlisle’s version of the song is her passionate yet sincere interpretation of its themes. The extent to which she made the song her own can be gauged by comparing her version to that of composer Sam Coslow himself. 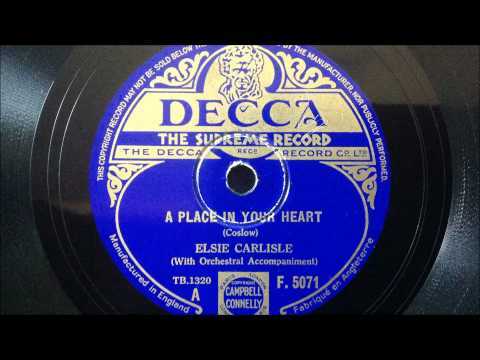 “A Place in Your Heart” was also recorded that year in Britain by Ambrose and His Orchestra (with vocalist Sam Browne), the BBC Dance Orchestra (under the direction of Henry Hall, with vocals by Les Allen, in a Van Phillips arrangement — at a recording session which also featured vocals by composer Sam Coslow himself, singing another of his songs, “Cupid”), The Masterkeys (vocals by Leslie Douglas), Jack Payne and His Band (with Ronnie Genarder), and Louis Freeman and His Playhouse Band.